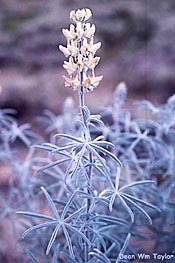 Lupinus padre-crowleyi is a ghostly lupine with pale clay-yellow flowers and herbage shrouded in shimmering grayness. I've seen its ghostliness in live plants up Big Pine canyon, and in dried herbarium specimens collected there and elsewhere by Mary DeDecker and others. It is on the California Native Plant Society's list 1B ("rare, threatened, or endangered"), and was declared a "Rare" plant by the State of California in 1981. It is listed federally as a "Species of concern". Its known populations occupy only a few sites at 8000 to over 10,000 feet elevation along the western edge of Inyo County. For nearly a decade (from 1969 to the late 1970s), this Eastern Sierra rarity was known as Lupinus dedeckerae Munz & Dunn, but then it was found to have been named earlier for Father John J. Crowley. Some botanical sources still give it the common name "DeDecker's Lupine" (1), while others call it "Father Crowley's Lupine". It is fitting that these two devoted lovers of the Eastern Sierra and Inyo County should share association with this rare and unusual species. I'll say a few words about the two namees, both well known locally, then delve into the somewhat complex history of this plant's discovery and naming. Photo by her daughter, Joan Busby, taken from an article by Stephen Ingram, "Introducing Mary DeDecker" in the CNPS "Bulletin", vol. 29(4):1-2, 1999. Mary DeDecker (2) was both an ardent student and champion of the flora of the Eastern Sierra. For half a century she collected specimens and amassed a treasury of information on regional native plants. She was largely self-taught, but made sure to consult frequently with botanical experts, especially at Rancho Santa Ana Botanic Garden in Claremont (RSA), and the California Academy of Sciences in San Francisco (CAS). Those experts praised her work which greatly raised the botanical awareness of this little studied region. 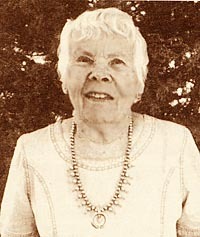 She was a founder of the Bristlecone CNPS chapter. She used its newsletter, in addition to the local newpapers, to sound the alarm when she saw threats to the special flora here. She prodded Inyo County Supervisors and citizens to stand up to the City of Los Angeles when the City was bent on taking so much water from the Valley as to cause severe damage to the natural environment. Mary died in the year 2000, at the age of 91. One manifestation of the love and admiration that persists for her is the new Mary DeDecker Native Plant Garden in Independence, which many members of the Bristlecone chapter have worked on so diligently. Click on the picture for a SLIDE SHOW of Crowley memorials. Photo from an article by W. Webster, "Tales of the Desert Padre", Holy Cross Magazine, Fall 2000. Prominent man-made features in the Eastern Sierra keep the Crowley (3) name alive: Crowley Lake; the Father Crowley Viewpoint on the western approach to Death Valley National Park; a monument on Highway 14 where he met his death in his old Ford (which, it is said, he always drove too fast, hurrying to this or that secular or religious appointment in his vast Eastern Sierra parish); and, recently, a mural on a building in Bishop. Though not a botanist, Crowley knew and loved the native plants of the mountains and deserts. In his writings, especially his weekly column "Sage and Tumbleweed" (which he wrote using the pseudonym Inyokel), he frequently referred to the plants that he admired on outings. He consulted the only book dedicated at that time to the desert regions, Coville's "Botany of the Death Valley Expedition", published in 1893; Crowley called it "the most complete survey of the flora of the valley extant". 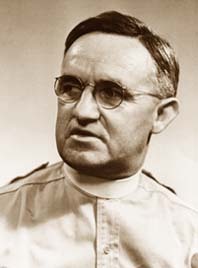 Father Crowley, the "Desert Padre", struggled mightily, and successfully, to enhance the economic base of the Eastern Sierra in the 1930s, primarily by publicizing it as a tourist mecca. Like Mary, he fought the City of Los Angeles over its water policies, to help the disheartened residents out of their depression over the City's depredations. His fatal auto accident occurred in 1940, when he was 48 years old. His legendary life and writings are lovingly presented in the 1997 book, "Desert Padre", by Joan Brooks. Now to the namers and collectors. Keep in mind that lupines are difficult to classify and to present clearly in a flora. The number of new world lupine species has been suggested to range from 200 to 1000 (4a) (4b), the wide range mainly due to it often being so difficult to nail down distinct species. The story of the naming of this plant begins with a false start of sorts. The prominent California/Nevada botanist A. A. Heller visited Inyo County in 1906, and, among other things, came away with 6 lupine species, 4 of which he thought were new (5). One, from McGee Meadows west of Bishop, he named L. inyoensis. You won't find it on the list of recognized lupine species in the new Jepson manual (1993), where it is noted as having been incorporated into L. argenteus var. heteranthus. It will be found, though, in earlier California floras by Munz (1959) and Jepson (1920s). Fast forwarding a bit, Mary DeDecker's first collection of the subject plant came from the North Fork of Big Pine Creek in 1957 (6). She was puzzled as to its identity, but considered it "near inyoensis". She made additional collections of it (in the same region, and also the West Fork of Coyote Creek) through 1976. The type specimen of Lupinus dedeckerae Munz & Dunn was to come from her third collection, made in July of 1968, which Mary had provisionally labelled L. inyoensis. The best population yet of Lupinus dedeckerae is from Logging Flat to the top of the ridge north of it, 10,200 feet. That is higher than it has been known before. At the higher elevations it occurs on sagebrush flats or slopes; lower down it is with sagebrush but in open places in forests of Jeffrey pine or lodgepole, sometimes with limberpine. It always seems to be where it gets a little extra moisture percolating down the slope from above. Penstemon papillatus sometimes occurs with it. As far as I know, Big Pine Canyon is still its southerly limit and the north end of Coyote Flats its northerly limit. In the late 1970s and through the 1980s, botanist Dean Taylor, who has a long association with Eastern Sierra botany, made 4 separate collections of the plant in the Big Pine Creek and Coyote Flat area. In 1988 he also found it, in a blue-flowered form, along a jeep trail on the Wheeler Ridge (7). 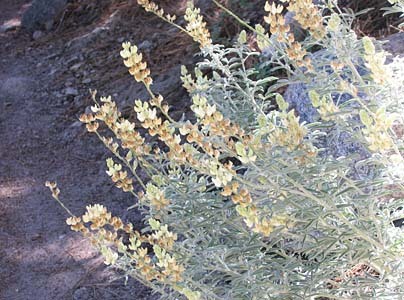 There are two indications of its occurrence in Tulare County, over the crest from Inyo County; an herbarium specimen collected by F. W. Peirson (in 1908) along Golden Trout Creek (a.k.a. Volcano Creek), and a mention in later literature of its occurrence at Summit Meadows (8). Thus it appears that, except for the Wheeler Ridge and Tulare County cases, most populations occur in the North Fork Big Pine Creek/Coyote Flat region. 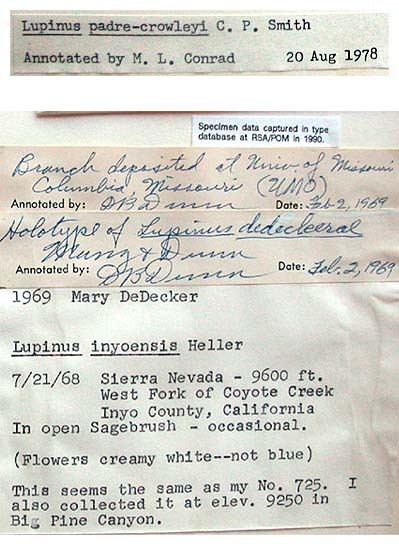 Subsequently, Munz and David B. Dunn (a lupine specialist based at the University of Missouri in Columbia) studied Mary DeDecker's collections, and decided that they represented a distinct and new species. Thus, in 1969, they provided a detailed description, in RSA's journal "Aliso" (10), of what they called Lupinus dedeckerae. They obviously came to the conclusion that the name L. inyoensis did not apply to these plants, but, due to a possible oversight, they failed to reconsider Smith's name. 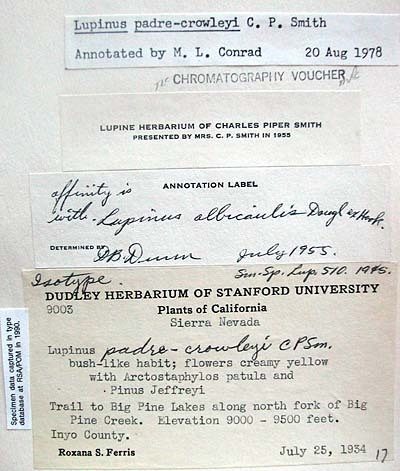 Finally, it remained for a student of Dunn's, Melvin Conrad (11), while working on his Ph.D. thesis on lupines in the late 1970s, to confirm that the Big Pine Creek/Coyote Flat plants were indeed distinct (and he also included Peirson's 1908 plant from Tulare County), but that they should go by the name of L. padre-crowleyi. This was because Smith's description, and the actual type specimen it was based on (Ferris' of 1934), clearly represent this species; thus, Smith's name, which was published in a valid manner, had priority. The name Lupinus dedeckerae Munz & Dunn had to be set aside. 2. Biographical sketches of the life of Mary DeDecker. Ingram, Stephen. 1999. Introducing Mary DeDecker. CNPS Bulletin Vol. 29(4):1-2. Ingram, Stephen, Anne Halford, and Betty Gilchrist. A Tribute to Mary. Owens Valley Committee website (www.ovcweb.org/About%20OVC/Mary.html). Nilsson, Karen B. 1994. A Wildflower by any other Name. Sketches of pioneer naturalists who named our western plants. Yosemite Association. Mary DeDecker, pp. 136-139. Zdon, Wynne Benti. 2000. In Memoriam: Mary DeDecker, 1909-2000. Toyabe Trails, October-November, p. 9. Also, Mary DeDecker, Spotted Dog Press website (www.spotteddogpress.com/dedecker.htm). 3. Biographies and writings of Father Crowley. Brooks, Joan. 1997. Desert Padre. The Life and Writings of Father John J. Crowley 1891-1940. Mesquite Press. Desert Hot Springs, CA. Price, Jean A. and James N. Price. 1993. The Wedding of the Waters. The Album. Chalfant Press, Bishop, CA. Stone, Irving. 1944. Desert Padre. Saturday Evening Post, May 20, p. 9. Webster, William E. 2000. Tales of the Desert Padre: Fr. John J. Crowley '15. Holy Cross Magazine. The subgenus of New World lupines "includes several hundreds of species (from 200 up to 1000) requiring further analysis of their authenticity." 4b.ILDIS, the International Legume Database & Information Service (website: www.ildis.org/), lists 623 lupine names, 499 of which it accepts. 5.Smith, C. P. See note 9. 6. Many thanks to Dr. Steve Boyd, Bea Beck, Michael Denslow, and Michael Honer, of the Rancho Santa Ana Botanic Garden, for gracious help in the library and herbarium. Much of the information in this and subsequent paragraphs came from herbarium specimen labels, and Smith's article in Species Lupinorum (9), seen in the library. Dedecker's Lupine (Lupinus padre-crowleyi) - a population occurs along the Round Valley Peak jeep road, growing on the steep, granitic sands amidst open Whitebark Pine (Pinus albicaulis) woodland. 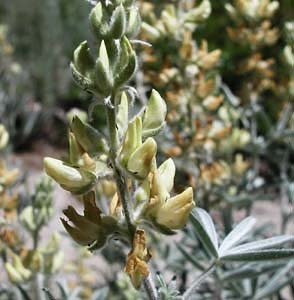 Plants in this population invariably have blue-flowers, by contrast to the mostly cream-white flowers of the Coyote Ridge-Big Pine Canyon populations. 8.Sierra Nevada Forest Plant Amendment - Part 4.6 (website: www.fs.fed.us/r5/snfpa/library/archives/feis/vol_3/part_4.6.pdf), p. 58. 9.Smith, C. P. August, 1945. Lupines in California - Inyo County. Species Lupinorum. Signature 30, Paper 48, pp. 503-511. Our attention was first called to the lupines of Inyo county by the published record of Amos Arthur Heller's botanical trip of 1906 (Muhlenbergia 2:209-214). In this report six species are mentioned as taken in this county, i. e. superbus, pratensis, inyoensis, hesperius, excubitus and odoratus, the first four being proposed as new. Our interest at that time stimulated a talk with Prof. William R. Dudley about the Inyo region and thus the desire to visit that county had its origin. For twenty-six years, however, that desire remained encysted in a mental capsule. Finally, in June 1932, we entered Inyo County via State Hiway 178, Walker Pass, and turned northward on U. S. Hiway 6 [now SR 14]. We knew that we were much too late for the desert annuals and hence were not surprised at the lack of "roadside lupines", after leaving Hiway 178. Hence we pressed northward to Bishop, out of which we radiated for some two days. A sidetrip to Laws yielded no results, but up in McGee Meadows we secured pratensis and what we labelled inyoensis. No trace of hesperius or superbus resulted from our search, tho we examined carefully the wholly dried marshlands at the edges Bishop. All conversations with the natives we contacted referred to the former beauty of the mountain valley and the then present devastation apparent everywhere, thanks to the thirst of the city of Los Angeles. Leaving Bishop, we returned to Lone Pine, where we turned up Lone Pine canyon to find excubitus still available; but evidently did not go far enough to locate the magnificus var. glaricola of Jones, although we were too late in the season for that species also. Owens Lake was driedup waste and the whole valley an unhappy prospect for collecting of lupines. We now again refer to the "saturday evening P O S T", this time to the issue of 20 May 1944, page 9, article, "Desert Padre". The story there presented opens with the "fall of 1934", the place, Lone Pine, two years and about four months after our introduction to that place. We may sum up, for our purposes, much of this excellent story by quotation from a prominent insert on said page 9, which will justify our reference to this article. Father John Crowley came back to Owens Valley to die, then survived long enough to restore life to a doomed California desert, and hope to its disillusioned settlers. This is the country that held the padre back from the edge of death. Ringed by the lofty Sierra Nevadas, the desert no longer threatens to revert to sage and sand, now blooms in the springtime. We hope that this proves to be the case. The following catalog is based mainly upon our notebooks prepared from specimens we have seen. We are glad to use for this lupine the name of the "Father John Crowley" whose last years were so completely dedicated to the service of Inyo County. 10.Munz, Philip A. 1969. California Miscellany - VII. Aliso 7(1):65-71. 11.Many thanks to Dr. Melvin L. Conrad for personal correspondence on this matter, copies of pages of his thesis, and the note by DeDecker on " . . .the best population yet . . . ", which Mary sent to Howell in 1977, and Howell in turn sent to Conrad. Conrad's thesis work was not published.